Eierkuchen | Are You My Mama? Heat a small nonstick skillet on medium heat. Add flour, salt and beat until smooth. Add remaining milk and vanilla and beat until smooth. Brush skillet with butter right before you are ready to pour the batter in. Pour about 1/2 cup of batter into the center of the hot skillet and tip it in all directions to spread the batter. When the pancake is light brown on the bottom and it looks “set”, flip the pancake and bake the other side for about the same amount of time, or until cooked through in the center. If your pan is too hot, turn it down. Stack pancakes and keep warm in a 200°F oven until all the pancakes are baked and you’re ready to serve! Serve with honey or fruit preserves and a pat of butter if you like. Notes: This is very close to the recipe that my German host family used to make. I like making them in a egg skillet so they are not too large. Also, this recipe is enough for 2 adults and 2 small children. If you have more people than that, I would double the recipe. Leftover cold Eierkuchen are delicious! Recipe Origin: My adaptation of cooks.com recipe. 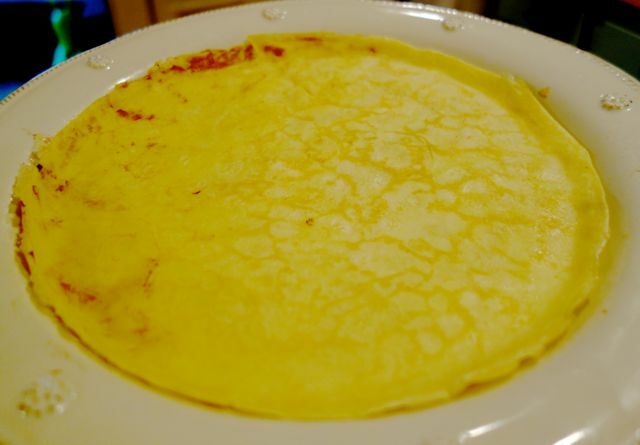 Here is another recipe for German Pfannkuchen. I’m going to get around to trying it one day soon to see what the difference is.